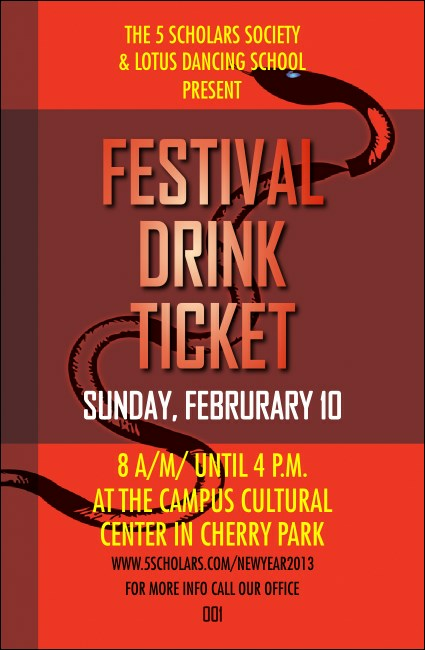 Drink to prosperity with this lucky red Chinese New Year Snake Drink Ticket! Featuring the intelligent and graceful snake, this ticket offers you the flexibility to creatively handle concession sales so the drink line keeps moving and no one misses the dancing. Each ticket features sequential numbering for greater security. Rejoice in your heritage with TicketPrinting.com!